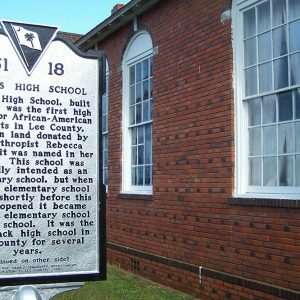 Dennis High School, which was constructed in 1936, was the first high school for African Americans in Lee County and drew students from Bishopville and rural areas outside the town. The handsome substantial brick school building improved education for African American youth in the county and also served as a center for community activities. Contrasted with the much larger Bishopville High School, built in the same year for white students, Dennis High School illustrates the inequalities of South Carolina’s “separate but equal” educational system. In 1948 a new black high school was built and Dennis became an elementary school.